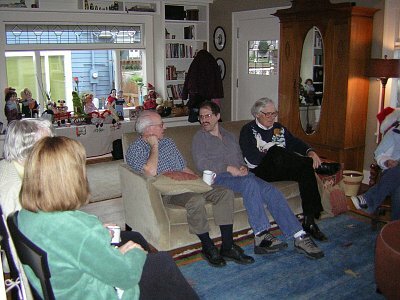 Hosts: Eric and Laura Gjovaag, at Eric's Parents House in North Seattle (Ravenna). 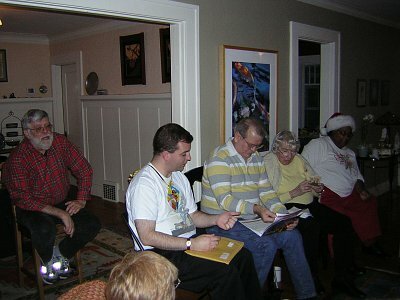 This was the last Oz event held at the Gjovaag's Seattle home, as they are selling it and moving to Manchester in January. In attendence: Eric & Laura Gjovaag, Karyl Carlson & Lacey, Marilyn Carlson, David & Dwayne Baker, Rosemary & Diane Jones, Robin & Arlene Hess, Bill & Hilary Loud, Evie MacDonald, Beverly Mendheim, and Kirk Stines. As soon as Kirk arrived, he led a field trip over to Third Place Books across the street. Gasoline Alley was also open. Those who remained at the house discussed the recent windstorm and their power outage experiences. 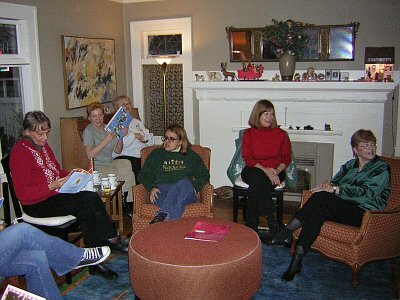 Next Oogaboo meeting will be at Eric & Laura Gjovaag's place, tentatively scheduled for April 14th. Eric's parents have also expressed interest in hosting at their new place in Manchester sometime next year. Hilary expressed an interest in hosting an Oogaboo meeting down in Eugene, Oregon. This will probably be a summer meeting. July 6-8th 2007, Winkie Convention. This will be THE Oz convention this year, as the other conventions seem to be not happening. The board meeting of the Club will be at Winkies, and it's the 50th anniversary of the Club. There are Registration Forms up for Winkies. Winkie Group Costume: Karyl's costume will be Billina, Laura will be the Lunch-Pail Tree, and Eric the Dinner-Pail Tree. Other costumes should be planned from Ozma of Oz, as the book is celebrating its 100th anniversary in 2007. Eric discussed how the Oogaboos will be putting together a "Guide to Holding A Rendezvous". We want other groups to have as much fun as we do. This will also be discussed on the mailing list. Suggestions included: Not worrying about schedules and just enjoying yourself, planning the next meeting before the first meeting leaves, not trying to duplicate the big conventions. We also discussed how much more comfortable it is to have the meetings at a person's home instead of a community center, but how daunting that would be for someone meeting people for the first time. An important point is to not take it too seriously, and to read the books and remember that parties are about having fun, and any group of Oz fans should have a goal of having a great deal of fun. Eric also discussed the need for Club members to support the Club by volunteering to help out with the Bugle. The nature of the Club itself was discussed: for instance, it's a club, not a magazine publisher. It's possible that new members do not realize that their dues aren't paying for a subscription to the Bugle, but for a membership in the Club itself. The Bugle is a publication that they get as a bonus for membership, and may not come out on the date expected. It was also suggested (slightly tongue-in-cheek) that Oz may not have switched to the current calendar, and thus the seasons appear to be off to us... or maybe the Bugle travels through time. Laura noted this website, and asked permission to publicize it. She also asked for materials to fill out the past Winkies list. She was promised more stuff than she will possibly be able to sort through. Group Discussion - Magic Workers in Oz. Led by Robin Hess. After Ozma outlawed magic, there were at least ten magic users who appeared in the books. Robin is trying to compile a complete list of other magic users. Are there magic licenses in Oz? Robin was asked to post his research to the mailing list for everybody to read and comment on. Show And Tell: Eric gave Hilary a belated Quiz Prize from last Rendezvous... the Dorothy of Oz calendar. At the discussion of calendars, a Snapfish calendar Laura made for Eric's Grandmother was passed around to show the high quality of on-line created calendars nowadays. Eric also showed off "The Discontented Gopher" and the recent Wizard of Oz comic translated from the French and published by Image Comics. Robin showed off the third volume of the French comic, still in French. Karyl showed off a Hallmark Keepsake Ornament she got for Christmas and an Emerald City bracelet made for her. Marilyn has some Oz window clings she got from Karyl for Christmas. Hilary has located a shop in Eugene that focuses on certain stuff, and has a large Oz selection. Lacey showed off her High School Homecoming T-Shirt: "There's No Place Like Home." Robin showed off his Oz presents, including "The Navy Alphabet" and a metal "Wizard of Oz" movie sign. He also got a Chinese edition of "The Wizard of Oz" from Hong Kong and "The Spiritual Journeys Along The Yellow Brick Road". Food: Lots of snacks and finger food provided to start the party. Grape tomatoes, do-it-yourself ham sandwiches, cake, cookies, nuts, grapes, punch, tons of sparkling cider, coffee, tea. Lots of salads and pasta. Beverly brought chicken empanadas. We also had ham and bean soup. Kirk brought his usual ice cream for dessert. An unfortunate bowl shortage forced people to wash soup bowls for ice cream. Quiz: Presented by Hilary Loud - "Mystery Title/Word Search"
Quiz Winner: Eric, who received the top prize and conceded the next quiz to David, Robin was second, Beverly and Karyl tied for third, Rosemary was fifth, and Diane came in sixth. As the quiz was wrapping up, Eric's parents and the pug Buddy arrived home, and Buddy immediately started cleaning up the floor from any lost crumbs. The party didn't continue long after the quiz finished. Farewell to the site of many Oogaboos in the past. 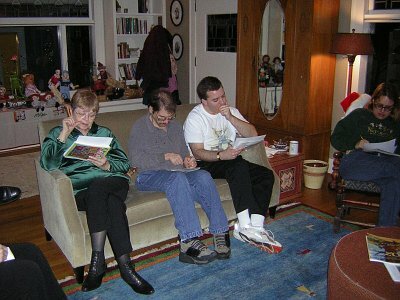 Karyl, David, Eric, and Rosemary take the quiz intently.